It’s a critical impairment to our thought process. Fear of missing out (or FOMO) causes us to do things we otherwise wouldn’t have decided to do. In the market, it’s mainly buying into stocks after a nice rally. The fear is that if you don’t, you’re going to miss out. This can lead to horrible timing. By the time FOMO kicks in, the easy money has already been made, and you are in for a tough road ahead. Still, we have to constantly be reminded to avoid FOMO. In the coming weeks, one sector is going to pop. Individual stocks from that sector are set to jump 10%, 15% or more in a matter of weeks. And when it happens, everyone you know will be telling you that now is the time to buy these stocks. But this isn’t the right time to buy into this sector. That’s because what will follow this pop is a month of sharp price declines. The real opportunity in this sector isn’t in the coming weeks, but in a couple of months. The sector is the biotechnology sector. I use the iShares Nasdaq Biotechnology ETF (Nasdaq: IBB). It is comprised of more than 150 biotech stocks, including well-known companies like Biogen Inc. (Nasdaq: BIIB), Celgene Corp. (Nasdaq: CELG) and Gilead Sciences Inc. (Nasdaq: GILD). Even though I’m not specifically looking at any one of these stocks, they are part of the sector as a whole, and thus will experience similar price swings. Over the next few weeks, these stocks, and the sector in general, will see a solid rally. It will bring that FOMO mentality and have you wishing you had bought those stocks. But unless you are an extremely short-term investor who is looking for gains in just a matter of days, this is a rally you want to avoid. 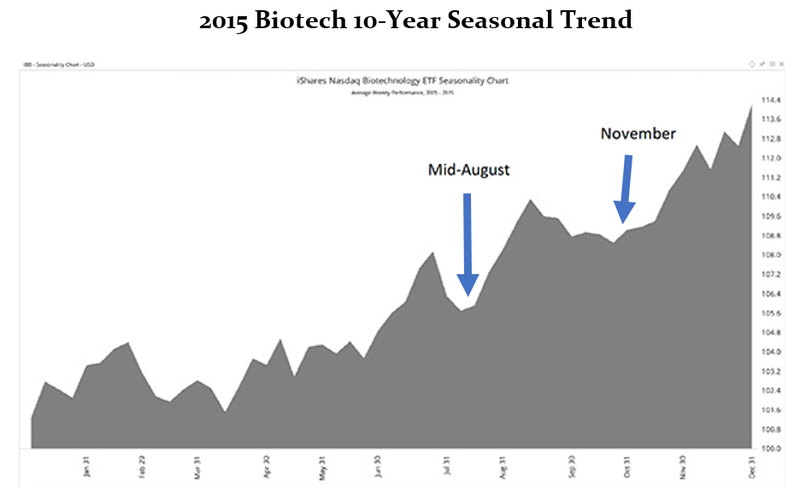 The biotech seasonal trend is one I track in my Automatic Profits Alert service. That seasonal trend used to begin around mid-August and last through the next year. This offered a nice buying opportunity to benefit from a rally that lasted months with little resistance. Keep in mind, I base my seasonal analysis on a rolling 10-year seasonal trend. That means in 2015, I was looking back to 2005. And in 2017, I’m looking back to 2007. In 2015, you can see that mid-August was a nice entry point. From there, you benefited from a sharp rally and only a modest pullback before shares steadily climbed higher through February. We see some changes in 2016. Here, the 10-year seasonal trend shifts some, making the spike after August experience a sharper pullback. But the August entry point is still lower than any point later in the chart. 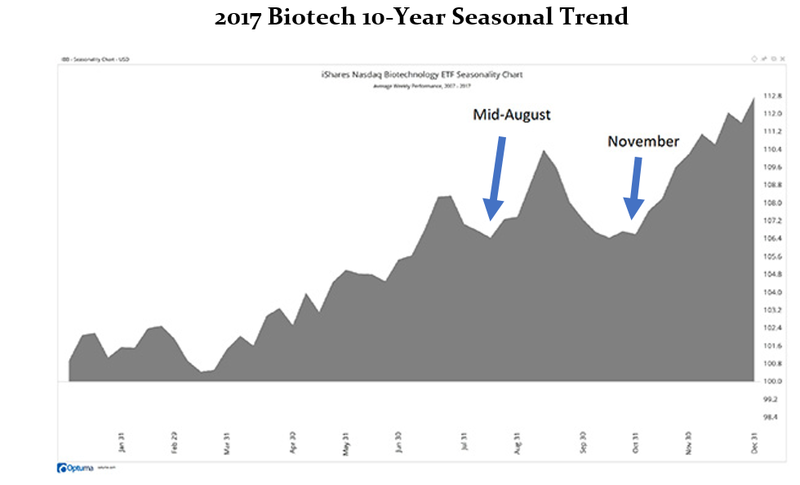 Then, in the 2017 10-year seasonal trend for biotech, the mid-August entry point is now completely eclipsed by November. This makes November 1 a more ideal entry point to experience less volatility and still benefit from a nice rally. 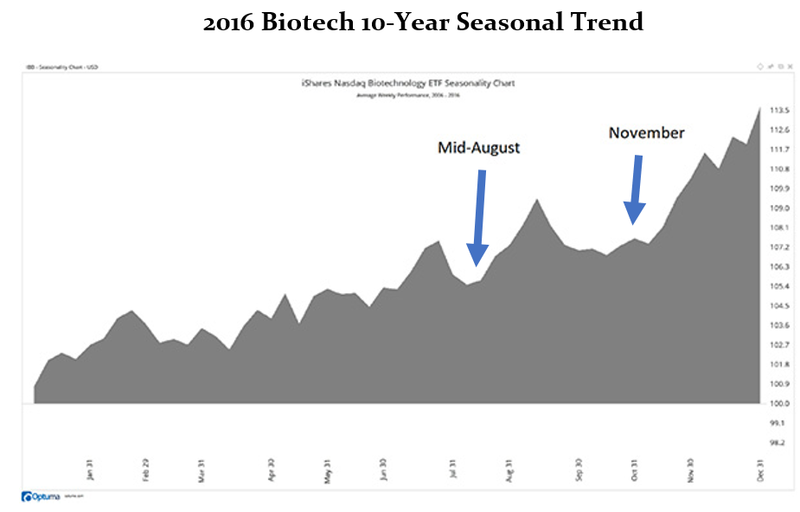 As you can see, there has been a dramatic shift to biotech’s seasonal trend. Don’t forget, there’s still a nice pop coming in the next few weeks in the biotech sector. Just be sure to use that as a reminder to avoid the FOMO mentality. Wait until we get closer to November 1 to jump in. Then you can ride the sector, and those stocks, much higher. Next »Hide From Washington’s Thought Police … Now!